The EM7195 HD media player from Eminen feature next-generation Realtek RT1183 DD C+ chipset and offers a DVB-T twin tuner which will let you to watch one Freeview channel and record another one at the same time, as well to schedule recordings and record up to two channels simultaneously. The EM7195 player supports a broad range of video formats, including MKV and H.264, it is also equipped with USB 3.0 ports, to transfer your movie faster form the PC and laptop to the hard disk inside the player. It also packs SATA port and card reader, 100Mbps LAN and 3 USB host ports. Along with capability to play movies and videos on your Full HD 1080P television, it is equipped with Media browser for pictures, video and music, supports SRT subtitles, with adjustable color and size, schedule recordings using the built-in EPG(Electronic Program Guide) and supports Dolby Digital, DTS bitstream, AAC, MP3 en WMA audio formats. 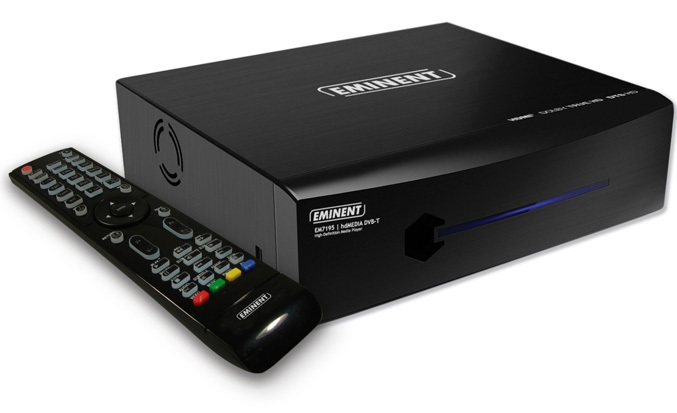 The Eminent EM7195 feature black casing made of brushed aluminium and will come bundled with backlit remote control,HDMI and USB 3.0 cable in the UK in March 2011.